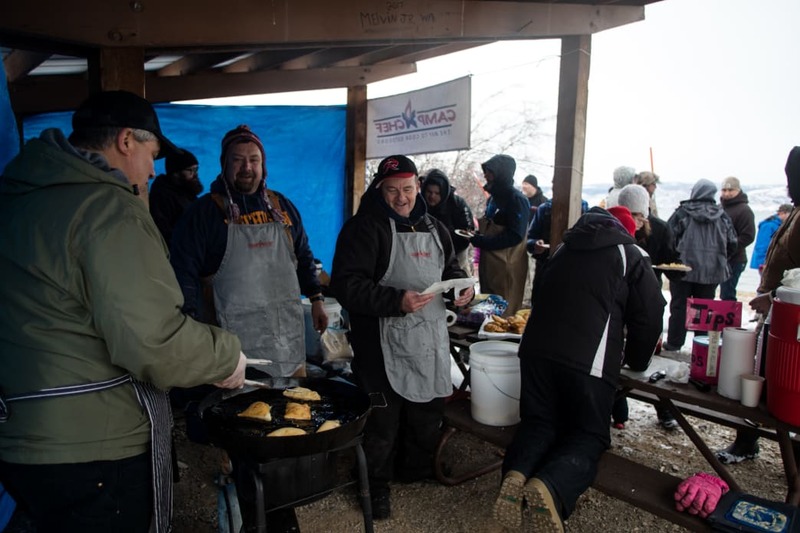 The best part of the annual January morning cookout at Bear Lake? "The Cisco!" says 8-year-old Annie Ballingham, without hesitation. There is a history to the Cisco run. The Cisco Disco serves up more than just fried fish. The story goes something like this: Once upon a time, a few adventurous souls from the Division of Wildlife Resources and Utah State Parks gathered on a cold winter morning in waders to dip their fishing nets, catch and fry a handful of these Bear Lake edibles. The next year there were a few more, and others after that, until the Cisco Disco was born. 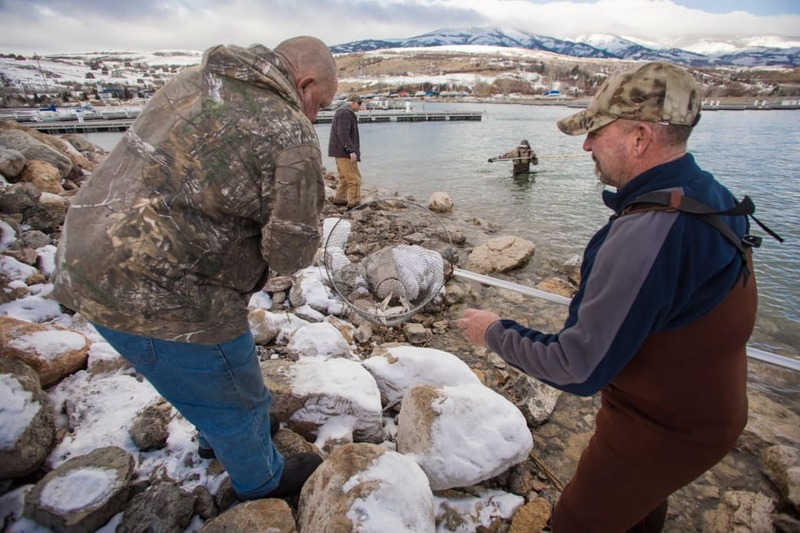 Named by the late KSL Outdoors host, Doug Miller, "Cisco Disco" describes the scene of the event — dozens of people, standing next to a frozen lake on a mid-winter morning, trying to stave off hypothermia as they await their fried food. Today, I am one of 200 or so "dancing" on the shore of Cisco Beach, dressed in my ill-fitting waders and felt-soled boots. I'm traveling with photographer Jim Urquhart, who is interested in capturing a few shots of netted Cisco emerging from the water, so he heads toward the lake. Unfortunately, in an odd bit of irony, the Cisco areavoiding Cisco Beach this morning. My toes already a bit numb, I resolve to remain on dry land, in part because I had not packed other boots and hoped to use these for snowmobiling later in the day. 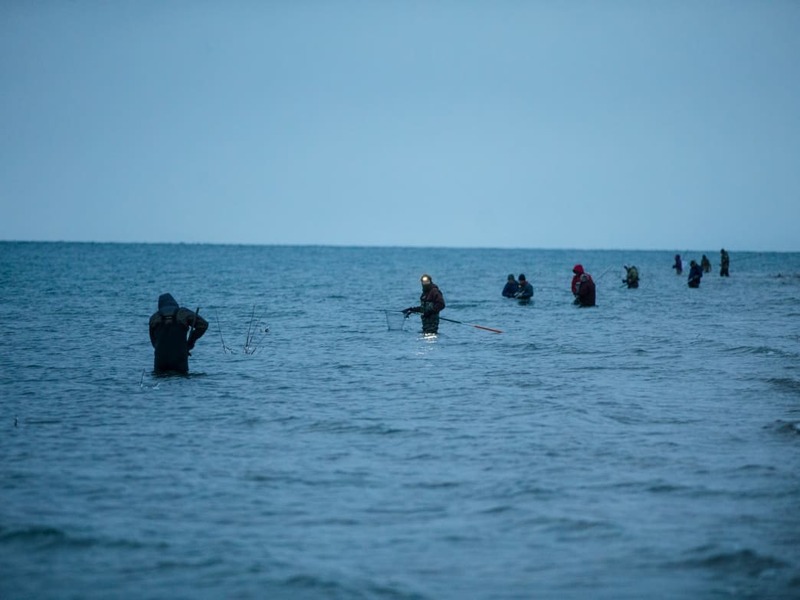 Most are in costume, some in swimsuits, some fully-clothed, and while most entered the water with smiles on their faces, with the chill of the winter water, it was a bit more difficult to emerge the same way. Netting cisco on the shore of Bear Lake. Fortunately, organizers caught plenty of Cisco in advance of the Disco to ensure plenty of food for the Saturday morning event. Scott Tolentino, DWR fisheries biologist at Bear Lake, has carried the baton in recent years. He's also added some of his own recipes. For the fish, "equal parts cornmeal, pancake mix and flour. And whatever seasoning you like, I use lemon pepper, seasoning salt, and black pepper." The tartar sauce? "One-half quart of mayo, one-half quart of Miracle Whip, pickle relish, onions, and a couple squirts of mustard." Attendees had raved to me about the tartar sauce, and I have to admit, it was the perfect sauce for a crispy Cisco. Tolentino had deboned the fish ahead of the event, although I'm told the bones are frequently eaten and hardly noticeable amidst the deep-fried batter. No longer is it just fried fish at the Cisco Disco, however. Ralph Blotter, a retired DWR conservation officer, added scones several years back — his own secret recipe. Lee Gyllenskog, former park manager at Hyrum State Park, makes the honey butter for the scones, and together — well, let's just say I ate too many. In the early 90s, Blotter's close friend, Andy Bolos, added "chips" to the "fish." Andy was the owner of Andy's Greek Restaurant in Ogden, which he sold a few years back to George Kolivias with one caveat, that the sale include a pledge to supply the Disco in perpetuity. Bolos passed away this past year. Still, just as he has done for a half dozen years or so now, on this Saturday in late January, Kolivias arrives early, with two five gallon buckets of thick cut french fries. It is a fried-food feast, and doesn't disappoint. Bear Lake is more known as a summer hotspot. "The whole population of the county is about 2,000. In the summertime, however, it becomes 30-40,000," says Bobbie Coray, editor of the Rich County Civic Times and a former president of the Cache Chamber of Commerce. Coray moved from Logan to the Bear Lake Valley after her husband retired from the Utah State University Mathematics Department. "I was spending more time here than I was in Logan. So, so we moved over here in 2006," she says. Coray, whose husband passed away last year, has sought to enhance the Bear Lake area, like helping to get the local library built. "I'm one of those people that get involved with the community," she says. Once summer ends, visits to Bear Lake begin to tail off. "I think the tourist bureaus have [an opportunity] because we have absolutely fantastic falls," says Bryce Nielsen, a former mayor of Garden City and retired DWR fisheries biologist. "The month with the least amount of wind at Bear Lake is September." Many of my own memories at Bear Lake include tales of the Monster, which we would occasionally see, always for a fleeting moment. Holiday rentals can really fill up, and there are the die-hards who attend the Disco year-in and year-out, but winter at Bear Lake is comparatively slow. Catyse Easton, who has a place in Garden City, drove up from Logan with her 15-year-old son, Kolton, to catch Cisco for bait. Most fishermen catch the small fish as bait for larger Bear Lake fish, which show a preference to the native swimmer. Aside from the Cisco Disco, few people catch them primarily to eat. Easton says she visits more in the winter months than in the summer. "Winter is the best time for Bear Lake," she insists. It is not an uncommon sentiment, and such was the thinking of the Bear Lake Convention and Visitors Bureau when they hatched the idea for the Bear Lake Monster Winterfest. Fortunately, a nearby warming hut will keep the mood high. The Bear Lake Monster has over a century-long legacy, which seems an obvious allusion to the Loch Ness Monster. The tale originated in the 19th century and was reportedly based on Native American legend. In the late 1800s, John C. Rich wrote several articles about the "monster," which he later maintained were in jest. Years later, one intrepid man built a "monster" boat and would occasionally drive around the lake, perpetuating the Bear Lake Monster myth with children who might catch a glimpse of the vessel. Today, Utah State University maintains a digital collection of art and writings about the Bear Lake Monster. Many of my own memories at Bear Lake include tales of the Monster, which we would occasionally see, always for a fleeting moment. Invariably a parent, mine or that of a friend, was happy to devise a new story about the creature. Those memories have taken on a "Lake Wobegon" quality for me. Learning to waterski on the glassy, clear water of an early summer morning; swimming to wood rafts anchored 20 yards offshore then lying under the sun, waiting for a boat to return; catching crawdads in the rocks at the marina, or flies in a jar at the cabin; attending community plays at Pickleville Playhouse; sleeping on a cot under the stars and picking raspberries. Bear Lake has a fairytale kind of way about it. Glen Gillies. Your do-everything MC: rodeo announcer/host/auctioneer. But Winter in Bear Lake has a similar capacity to create memory-making experiences. For years, the Cisco Disco had been drawing crowds to the lake in the winter. The Bear Lake Convention and Visitors Bureau reasoned that they could build on this — add a social, a chili cookoff, perhaps a polar plunge-type event and some vendors. In 2018, the Bear Lake Monster Winterfest marked its ninth year, and it continues to grow. Back at the Garden City Marina, the Winterfest festivities are in full swing. Near the dock, a group of individuals are standing over their portable stoves and large pots. A Bear Lake chili cookoff means several varieties of meat that aren't beef. "I've got a pound of deer steak, three pounds of hamburger, course ground deer burger, his is moose, and he's got elk," says Talentino, the defending champion. The Conks are using the moose. "Brian is the heater, and I'm the sweeter," says Emily, who entered the chili cookoff together with her husband. There's a trick to the sweeter, says Brian. "You let it cook almost all the way down, and then," he pauses, "you put peaches in it." The heater, he says, has habanero garlic, pickled by a friend's grandmother in Colorado. Each participant has cups for sampling, and a tip jar for the public to choose their favorites. The tips and other proceeds from the Winterfest the year I visited went to Common Ground Outdoor Adventures, a Logan-based charity. Lindsey and Brittney Wahlberg, sisters from Garden City, are the winners of the 2018 chili cookoff and take home a gift certificate to Sportsman's Warehouse. Meanwhile, prep for the Monster Plunge is underway. 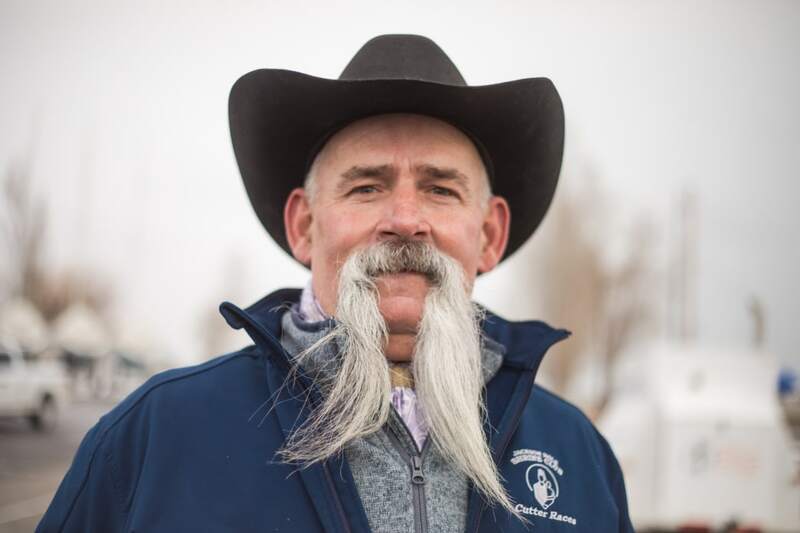 "It's probably 30 degrees warmer outside than it was a year ago," says Glen Gillies, a sort of "do everything'" rodeo announcer/host/auctioneer. Gillies is the undeniable king of Movember: He wears a Yosemite Sam mustache that reaches his chest — an accessory to his rugged persona. Gillies, who hails from Malad, Idaho, has come to MC the Bear Lake Monster Winterfest, which includes announcing contest winners and color commentary for the Monster Plunge. "Jay the cowboy, you're gonna start us off," he says, as Jay makes his way toward the water. Through throngs of spectators, 95 brave souls queue up at the edge of the dock. Group by group, dressed in full regalia, they gladly add their names to prior rolls of poor-decision makers. 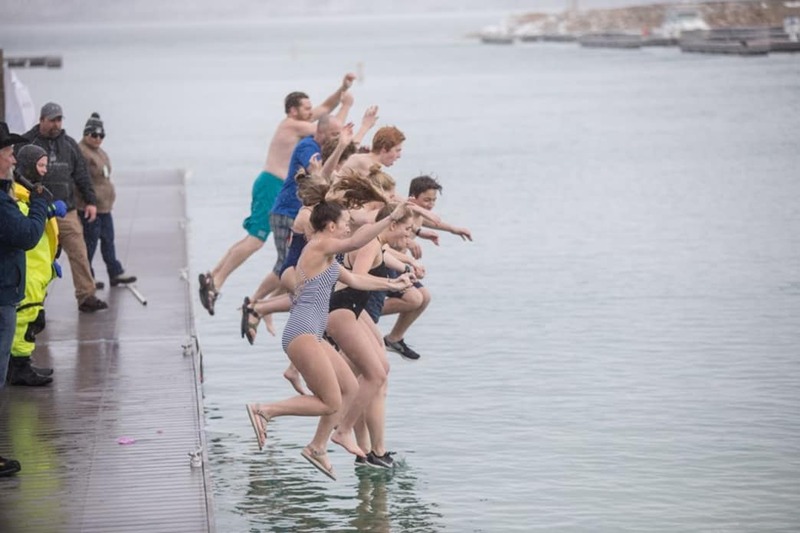 Most are in costume, some in swimsuits, some fully-clothed, and while most entered the water with smiles on their faces, with the chill of the winter water, it was a bit more difficult to emerge the same way. Fortunately, a nearby warming hut kept the mood high. With hundreds of happy attendees, Winterfest is an indisputable success. After visiting, it is hard to miss the peacefulness of Bear Lake in the winter. It feels private, but remains inviting. 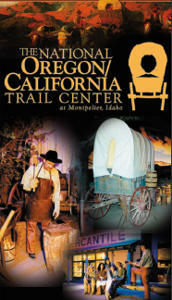 The atmosphere is relaxed, and for the adventurous, the options are endless. With plenty of lodging, snowmobiling, skiing, fishing, snowshoeing, and a host of other activities, are all just a couple of hours north of Salt Lake City, at Bear Lake. Written by Ben Whisenant for Utah Office of Tourism.